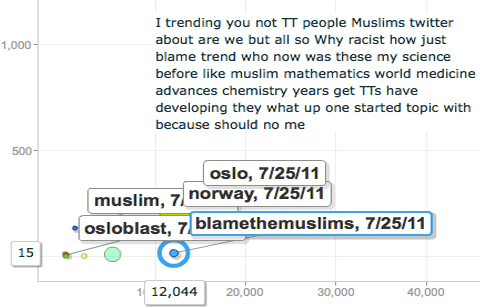 In Figure 4, you can see the various tweets from a Twitter user who initially is sure that the bomber is Muslim and a deserved response to Norway’s “liberal policies”. But then over time, you see can see his narrative shift. At first, these tweets are sent to particular users displaying liberal and cautionary sentiment regarding the then recent bombing. Over time, after reports indicate a Caucasian and later anti-Muslim suspect, the tweets shift in tone to theories that the shooter is somehow linked to al-Qaeda and, finally, that various Twitter users are Muslim sympathizers. Both tabloid and mainstream media offered an antagonizing image. Several tabloids papers ran big front page headlines suggesting that al-Qaeda was responsible for the attacks. News of the perpetrator’s ethnic and political identity did not stop the highly suggestive— reaching absurd levels – speculations in the US either. The Muslim link was for instance declared “inevitable.” “Experts” clamoring for attention showed not only a lack of professionalism, but also—by speculating, rather than reporting facts—contributed to a dangerous scapegoating that will likely encourage more violence.